Do you love a good Twitter Party? I am excited to be co-hosting my first twitter party! It's a party for Canadians about how to make Thanksgiving snacking and entertaining easy! 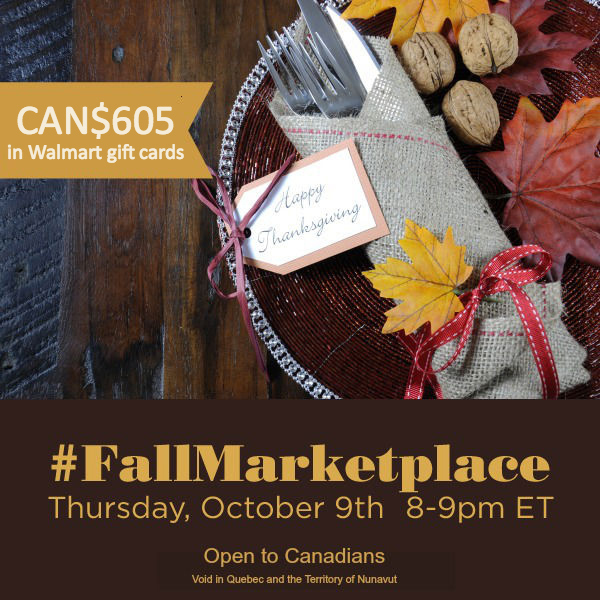 On Thursday, October 9that 8pm ET, please join us for the #FallMarketplace Twitter Party where we’ll be discussing simple ways to make your Thanksgiving celebration easy and giving you a chance to win prizes! Are you ready to celebrate Thanksgiving on October 11th? I'm not! haha We'll be getting together with extended family a couple of times, but I'm not sure what we're bringing yet, so I've got some work to do! Before your guests arrive and you being your celebration, be sure to head to Walmart to stock up on all the essentials! From chicken and pumpkin pie to help make your celebrations complete to Wheat Thins and carrots for snacking success, Walmart has all the items you need to make your get together memorable! And once it’s over? Walmart makes clean-up a breeze! Be sure to join us for this fun party to learn all about how your celebration can be simplified with the right items! Plus we’ll be sharing information on in-store demos to help you find the perfect items for all your Thanksgiving needs! Join me and RSVP for the #FallMarketplace Twitter Party on SoFabChats! Can't wait to party with you tonight!! It's going to be fab! !